Third-seeded Egyptian Karim Darwish upset compatriot Amr Shabana in the final of the $147,500 Qatar Classic to win his second PSA Super Series squash title in three weeks at the Khalifa International Tennis & Squash Complex in Doha. Both players had reached the climax after gruelling five-game semi-finals - Darwish, the world No3, gaining his first win over England's world No2 Nick Matthew in almost two years, and reigning world champion Shabana overcoming France's fourth seed Gregory Gaultier. Darwish recovered from a game down to beat Shabana, the second seed looking for his maiden Super Series title his year, 8-11, 11-2, 11-7, 11-6 in 54 minutes. "We know each other's game so well, we both take the ball so early, and they were some accidents as we were going for the ball. But it was a fair game, a clean game," Darwish said afterwards. "It was more of a mental match than a physical one," added the 29-year-old from Cairo. "In the middle of the third, we had some crucial points, I gave it a bit push to make sure I would come on top leading 2/1. And after that, I think he lost a bit of his focus, and I gave it a good push to finish. "When you come to a tournament, you want to win - but you can't expect to win nowadays, as the competition is fierce and there are so many formidable players around," concluded Darwish (left), who won the El Gouna International in Egypt last month and now boasts 19 PSA Tour titles. Despite two 70-minute matches leading to the final, Shabana had no excuses: "Both of us had strong matches earlier in the week, so I can't blame this defeat on a long match! "In the second, he played far too well, my length dropped and he took full advantage of it," explained the former world number one. "But in the third, I had my chances. But today was not to be my day." The Qatar triumph sees Darwish move up to third place in the latest 2010 PSA Super Series Rankings, the penultimate list before the final event of the year - the Punj Lloyd PSA Masters in Delhi in December. Egypt's world No1 Ramy Ashour heads the rankings, with Nick Matthew in second place. England's Peter Barker strengthened his all-important position in the top eight, 30 points ahead of ninth-placed Australian David Palmer. 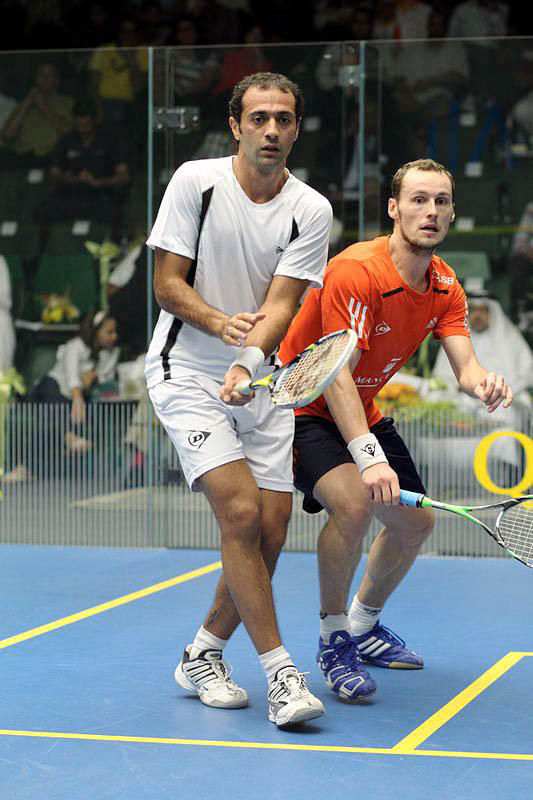 Egypt's third seed Karim Darwish (left) fought back from two games down to beat English favourite Nick Matthew to claim a surprise place in the final of the $147,500 Qatar Classic, the ninth and penultimate 2010 PSA Super Series squash championship at the Khalifa International Tennis & Squash Complex in Doha. Darwish, winner of last month's El Gouna International in Egypt, will face compatriot Amr Shabana, (Below Right)the four-time world champion looking for his first Super Series win this year, who beat Frenchman Gregory Gaultier. At two games up in the repeat of last year's final, defending champion Nick Matthew looked to be heading for his eighth Super Series final this year. But Darwish turned his game around and stunned the 30-year-old world number two from Sheffield by battling back to win 8-11, 5-11, 11-8, 12-10, 11-8 in 73 minutes. "Nick has been winning pretty much everything last year, he was world number one still a few months back, so beating him tonight is very special to me," Darwish said afterwards. "When I can play like that, I'm alright. "Against Shabana tomorrow, I won't be able to afford to wait the third game to play. I'll have to start from the first rally," added the 29-year-old world No3 from Cairo, now in his 32nd Tour final. The defeat was Matthew's second in less than two weeks from the position of a 2/0 lead - after crashing out of the Kuwait Open to England team-mate Daryl Selby. "Karim did well to come back from 2/0 down," said the Englishman. "It's really a good effort, well done to him. "You are never too old to learn. Now there's a few weeks of hard work for the Worlds - whatever the result here, that's always been my target." In the other semi-final, second seed Shabana saved a match-ball to beat Gaultier, the fourth seed, 3-11, 11-4, 11-7, 6-11, 12-10 in 71 minutes to earn the 39th PSA Tour final appearance of his career. "Today, I don't feel like he lost," said Shabana, the world No5 from Giza. "I just feel that I've played an incredible match against an incredible player, and in the end, it was just a flip of a coin. One minute it was me, then the next minute it was him, next it would be me again. Honestly, it was a flip of a coin!" Producing one his best results for almost a year, Egypt's Amr Shabana defeated Englishman James Willstrop in the $147,500 Qatar Classic to reach the semi-finals of the ninth and penultimate 2010 PSA Super Series squash championship at the Khalifa International Tennis & Squash Complex in Doha. According to the seedings, third seed Shabana was expected to beat the 27-year-old from Leeds - but Willstrop is currently ranked above the four-time world champion and has achieved three successive wins over Shabana since last losing to him in the 2009 World Open in Kuwait. However, after Willstrop took the opening game for the loss of just two points, it was Shabana who then took control before closing out the match 2-11, 14-12, 11-4, 11-7 after 71 minutes. "At the start, he played well, but especially, he stuck to his game plan, while I didn't stick to mine," Shabana said afterwards. "I developed a sort of mental block for a few times I've been playing against him - but, after a while, I just thought to myself, I might as well play, I've got nothing to lose. And from that point on, it was pretty close. "You've got to be careful with James, because he can shut you out if he gets into a zone. I was playing every point not caring if I won or lost, just playing each and every one of them. "So I'm really proud that I succeeded to stick in there today." Willstrop was full of praise for his opponent: "Hats off to him - he keeps being written off and he keeps coming back. He is obviously back into a good physical shape. I watched him last week in Kuwait - his matches were just before mine - and watching him just helped me. Nobody strikes the ball better. "I have an immense respect for the guy, he's got an outstanding attitude on court. I absolutely hate losing to anyone, but there is nobody I'd rather lose to." Shabana will now face French rival Gregory Gaultier in a repeat of last month's Kuwait Open semi-final. The fourth seed from Aix-en-Provence beat England's Peter Barker after the sixth seed retired injured after just 28 minutes with the score standing at 11-4, 11-1. "My 'glute' packed up in the middle of the first game," explained Barker afterwards. There will also be Egyptian interest in the other semi-final when third seed Karim Darwish takes on Nick Matthew, the top seed from England. Darwish, winner of last month's El Gouna International in Egypt, stopped Frenchman Thierry Lincou 13-11, 11-2, 6-11, 11-9 in 68 minutes, while Matthew avenged his defeat by Daryl Selby in the Kuwait Open by beating his fellow countryman 11-5, 11-3, 11-5. "What happened last time was in my mind, of course, but it was different this time," said Matthew after his revenge win. "It's hard to do what he's done in the last couple of days and pitch up again. "I wasn't in any mood to let him settle into any slow rallies which might have helped him loosen himself up, and on an unforgiving court like this he was having to stretch for it instead of counterattacking as he likes to do. The pressure kept building and I knew the opportunities for winners would come." The top eight seeds took their places in the quarter-finals of the $147,500 Qatar Classic after contrasting second round wins in the ninth and penultimate 2010 PSA Super Series squash championship at the Khalifa International Tennis & Squash Complex in Doha. 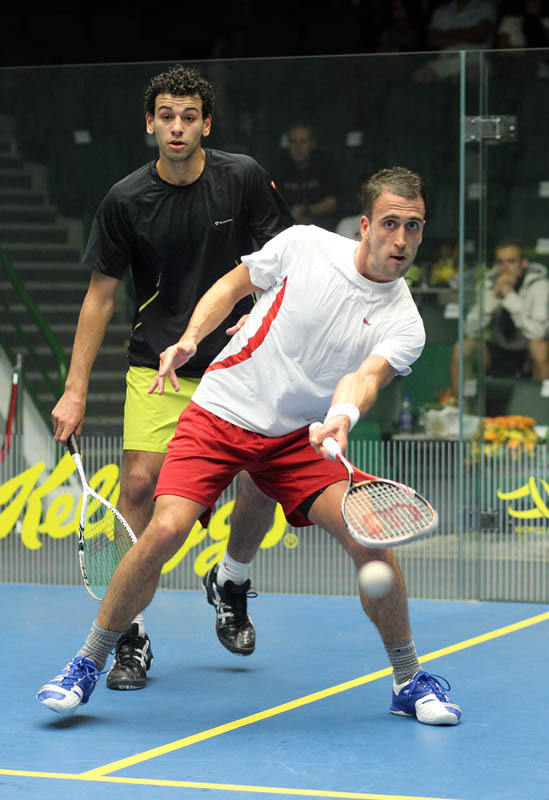 England's Nick Matthew and Egyptian Amr Shabana - due to face each other in Friday's final - both overcame English opponents in straight games. Second seed Shabana, the 2007 champion, despatched fellow left-hander Adrian Grant 11-7, 11-9, 11-9, while top seed Matthew beat former training partner Alister Walker 11-5, 12-10, 11-4. "It's not as awkward it was to play Ali, as we don't train three to four times a week anymore, so he surprised me with a few things I forgot he did - then I surprised him with a few things I did," Matthew explained said afterwards. "The second was crucial - I think that if he'd won that one, he would have taken a lot of confidence, and it would have become a hard match." Fellow Englishman Daryl Selby survived his second five-game marathon in 24 hours when he defeated Australia's 14th seed Cameron Pilley 11-5, 9-11, 11-5, 5-11, 11-9 in 102 minutes. "I've worked pretty hard this week I would say," exclaimed the eighth seed from Essex after reaching his second successive Super Series quarter-final. "Cameron hits the ball so well, he is such a great player. He's got one of the best forehands on the circuit, and everybody knows that. He played some stunning winners tonight, but luckily, I managed to weather the storm." Another Australian campaign came to an end when Frenchman Thierry Lincou beat fellow Tour veteran David Palmer 8-11, 11-4, 11-5, 3-11, 11-5. The bruising 75-minute defeat leaves Palmer needing to do well in the final Super Series event of the year in Delhi in order to qualify for next year's World Series Finals in London. "Today, he was just too good, far too good," said a dejected former world champion and world number one Palmer later. "Things haven't really gone my way this year, and I haven't hit the ball enough since the Commonwealth Games - it showed today. Physically, I was fine, but Thierry was in total control, and that's his trademark." Meanwhile, England's Peter Barker (right) strengthened his claim on a place in the top eight of the year's final PSA Super Series Rankings by beating Egypt's rising star Mohamed El Shorbagy 4-11, 13-11, 14-12, 12-10 in 67 minutes. "I played him only once before, in Saudi last year, and he took me by surprise - his speed, especially for a big guy, is just excellent," said Londoner Barker, the sixth seed. "I wanted to win, to get back on parity, and I was expecting a tough match, it didn't disappoint!" England's Daryl Selby survived the toughest test on the second day of first round action in the $147,500 Qatar Classic as all eight seeds progressed to the last 16 round of the ninth and penultimate 2010 PSA Super Series squash championship at the Khalifa International Tennis & Squash Complex in Doha. The eighth seed from Essex twice stemmed fight backs by Olli Tuominen before beating the experienced Finn 11-9, 6-11, 11-9, 8-11, 11-8 in 66 minutes. "It was an emotional rollercoaster," the 28-year-old world No13 said afterwards. "Olli played an excellent squash today - he is always at his best on that kind of court. "I had to dig in, play scrappy squash sometimes. I was on the back foot all the time, and at the end, it came down to a toss of a coin." Selby will now face Cameron Pilley, the 14th seed from Australia who defeated qualifier Borja Golan, the former world No10 from Spain making a comeback after knee surgery, 9-11, 11-5, 11-9, 11-3. There were further Australian successes from David Palmer and Stewart Boswell. Palmer, the 11th seed playing in his first Tour event since sustaining an elbow injury in the Commonwealth Games, despatched unseeded Englishman Jonathan Kemp 11-5, 11-9, 11-6, while 16th seed Boswell beat Egyptian qualifier Omar Abdel Aziz 11-6, 11-9, 11-5. "I haven't been able to hit the ball much obviously, but the main purpose today was to win the match, and 3/0 is a good result against Joey on that court," explained four times runner-up Palmer later. In what will be their 21st Tour clash since May 1999, Palmer will face French rival and fellow 34-year-old Thierry Lincou. The former world champion from Marseille beat Egypt's Hisham Mohd Ashour 6-11, 11-5, 16-14, 11-9. Event favourite Nick Matthew ended local interest in the event with an 11-2, 11-3, 11-3 win over Qatari wild card player Ahmad Mohd Al-Tamimi. The world No2 from Sheffield now plays close friend Alister Walker (right), the 15th seed who fought off determined resistance from qualifier Tom Richards before beating his fellow Englishman 6-11, 11-6, 11-8, 9-11, 11-6 in 64 minutes. "I have a lot of admiration for Tom, I see him as I was two years ago, a top qualifier, and knowing that if he has a good draw, he can go through to the last 16," said Leeds-based Walker. 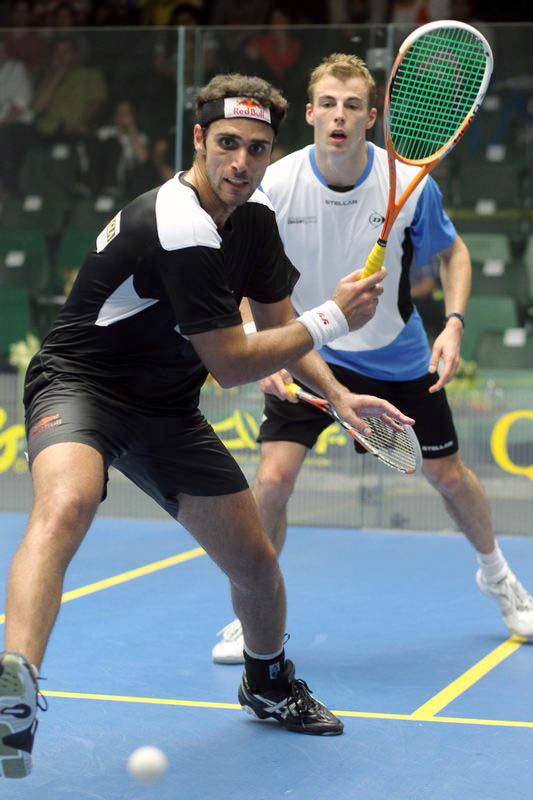 Omar Mosaad pulled off the first upset in the $147,500 Qatar Classic when he beat fellow Egyptian Wael El Hindi, the tenth seed, to claim a surprise place in the last 16 of the ninth and penultimate 2010 PSA Super Series squash championship at the Khalifa International Tennis & Squash Complex in Doha. Only days after celebrating a career-high world No17 ranking, Mosaad battled for exactly one hour to overcome Cairo compatriot El Hindi, the 30-year-old world No10, 11-9, 7-11, 11-8, 11-5. 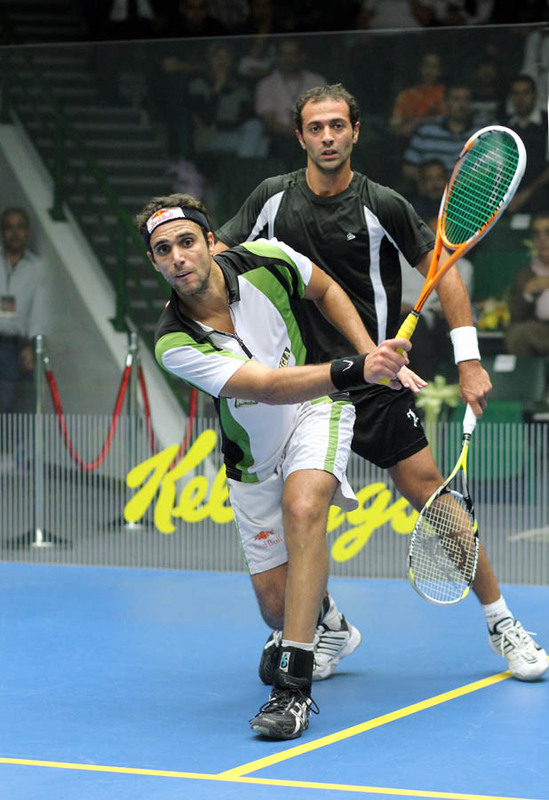 "This match was always going to be tough," Mosaad said afterwards. "Our head to head was 2/0 up to last year in Mumbai, when I took my first win. So today, I was really up for it, as I wanted to confirm my win last year. "Also, a victory here would really help my ranking," added the 22-year-old. "I have now entered the top 20, and I would hope to get top 16 with that victory." Mosaad was joined by two further Egyptians in the last 16. Earlier in the day, second seed Amr Shabana despatched qualifier Nicolas Mueller 14-12, 11-9, 11-7 - but later acknowledged that the rising Swiss star shows potential. "It's the first time I've played him - he's got good hands, good reach, good movement, and a clean technique, but I think he'll be really dangerous once he gets the balance between attacking and patience," explained the reigning world champion and Qatar champion in 2007. "He'll be a good player, he is very fair." It was at the end of the day that 19-year-old Mohamed El Shorbagy became the third Egyptian through after overcoming unseeded compatriot Tarek Momen 16-14, 11-6, 11-9. But a trio of Englishmen also secured places in the last 16 - led by fifth seed James Willstrop. The world No4 from Leeds, who lies in third place in the current Super Series rankings, removed South African qualifier Stephen Coppinger 11-9, 11-6, 11-5. Shortly afterwards, Londoner Adrian Grant recovered from a game down to beat fellow Englishman Joey Barrington 10-12, 11-2, 11-1, 11-5 - and later sixth seed Peter Barker, also from London, got the better of top-ranked German Simon Rosner 11-5, 13-11, 5-11, 11-8. Fourth-seeded Frenchman Gregory Gaultier discovered a tough opponent in his first match against Egyptian qualifier Karim Abdel Gawad. The 19-year-old took the opening game against former world number one Gaultier, before the 2007 runner-up came back to take the next three to win 8-11, 11-8, 11-3, 11-4 in 57 minutes. "For his second time on a glass court, I must say he was impressive, especially in the first game," Gaultier acknowledged. "He is only 19, so only a couple of years, and he'll be up there. "You just can't relax against these young players - they come on court to beat you! I remember when I was that age, whoever I was playing, even the number one player in the world, I would come to beat them, and give it all what I had." Finland's Henrik Mustonen gave himself the best possible present on his 20th birthday when he beat Egypt's Andrew Wagih Shoukry in the qualifying finals of the Qatar Classic to earn a place in his first PSA Super Series squash event main draw. 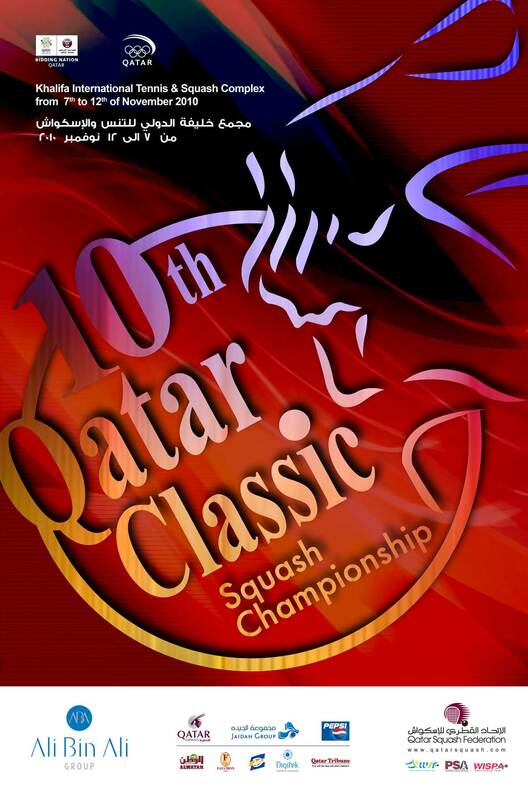 The $147,500 Qatar Classic, the ninth and penultimate 2010 PSA Super Series championship, is celebrating its 10th year at the Khalifa International Tennis & Squash Complex in Doha. Mustonen, the world No88 from Hollola, near Lahti, defeated fellow surprise qualifying finalist Andrew Shoukry 11-7, 10-12, 14-12, 11-8 in 57 minutes and will now face Egypt's No3 seed Karim Darwish in the main draw. "This is the biggest tournament I've ever played in, so to qualify is really, really, nice," birthday boy Mustonen said afterwards. "I knew he had a hard game yesterday, but mine wasn't exactly easy, so I couldn't try to take advantage of that. "It will be a good experience for me to play on the glass court - I don't get to play the top guys very often. And it will be good for my coach to be able to see me play," added the lowest-ranked player to qualify. South African Stephen Coppinger was in sensational form as he despatched New Zealander Campbell Grayson 11-1, 11-2, 11-3 in just 29 minutes. "Needless to say I'm very happy with my game - I didn't do much wrong there," explained the 26-year-old from Cape Town. 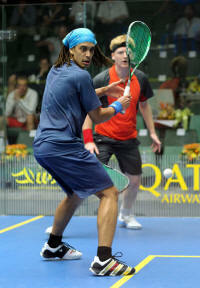 "Everything is going well so far," added the world No43 who now lines up against England's fifth seed James Willstrop. Rising Swiss star Nicolas Mueller earned himself a place in the main draw with a quick win over good friend Yann Perrin. The 21-year-old from Zurich despatched the Frenchman 11-6, 11-7, 11-2 in just 26 minutes. "This is the second time I've got into a big one - a platinum one," said Mueller. "Last week in Kuwait was my first one, and this is very rewarding." Mueller is drawn to face the event's new second seed Amr Shabana, the world No5 from Egypt who was the Qatar Classic champion in 2007. 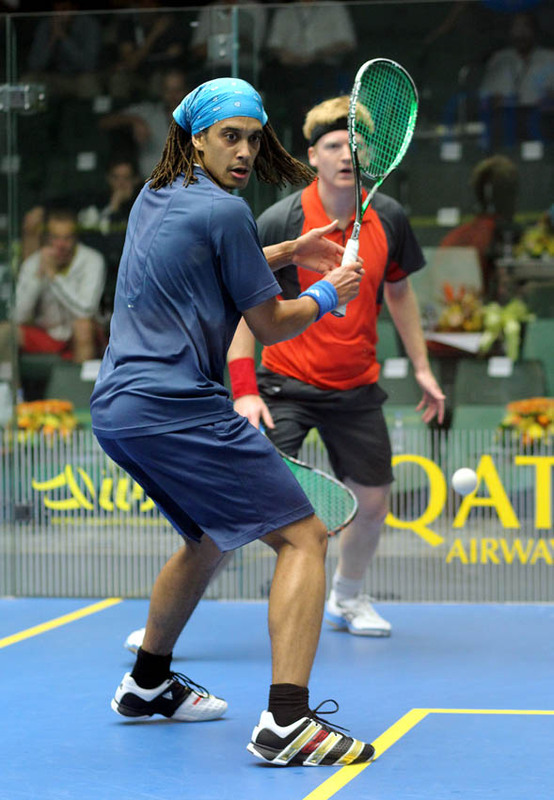 Egypt's Andrew Wagih Shoukry survived a gruelling 98-minute battle in the $147,500 Qatar Classic to claim an unexpected place in the qualifying finals of the ninth PSA Super Series squash event of the year at the Khalifa International Tennis & Squash Complex in Doha. The 20-year-old from Cairo, ranked 89 in the world, reached almost 50 places above him in the rankings to overcome 23-year-old Australian Ryan Cuskelly 9-11, 15-13, 8-11, 11-7, 12-10 in the day's biggest upset. Shoukry now lines up against the other surprise name in the qualifying finals line-up: Henrik Mustonen, a 19-year-old from Finland who is ranked a single position above the Egyptian, despatched higher-ranked Frenchman Mathieu Castagnet 11-7, 11-8, 9-11, 11-3 in exactly an hour. Scotland's Alan Clyne earned a clash with the top-ranked player in the qualifying competition after beating Egypt's new world junior champion Amr Khaled Khalifa 11-6, 11-8, 11-7. The 24-year-old world No52 from Edinburgh will now face fellow Briton Tom Richards, the world No32 from England who had a first round bye. The eight qualifying finals matches have a broad international flavour - reflecting representation not only from England, Scotland, Egypt and Finland, but also Switzerland, France, Germany, Hong Kong, South Africa, New Zealand, Spain and Australia. News reached the organisers on the eve of qualifying that top seed Ramy Ashour has been forced to withdraw from the event. The world number one from Egypt - who won last week's Kuwait Open to open up a 200-point lead at the top of the 2010 PSA Super Series Rankings - has sustained an injury to his right ankle in training. England's world number two Nick Matthew now assumes the title of top seed, while Kuwait Open runner-up Amr Shabana is elevated to No2 seed. 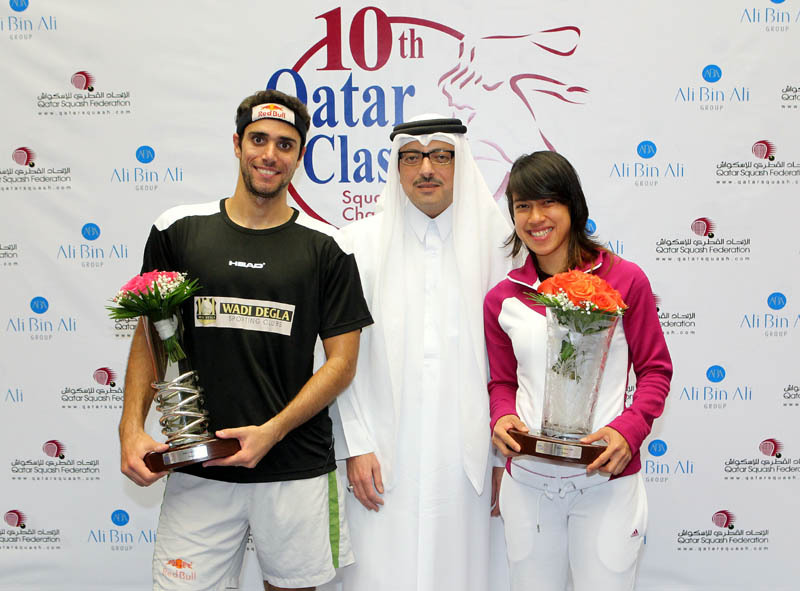 Malaysian squash star Nicol David reached another significant milestone in her illustrious career when she beat Australian Rachael Grinham in the final of the $74,000 Women's Qatar Classic to net her 50th WISPA World Tour title at the Khalifa International Tennis & Squash Complex in Doha. The top-seeded world number one overcame the disappointment of losing at the semi-final stage last year by beating unseeded Egyptian Nour El Tayeb to reach the 2010 final. And the climax against career-long rival Rachael Grinham, the fourth seed and a former world champion, marked the pair's 32nd Tour clash since the first in April 2000 in Malaysia. David was in dominant form from the outset, triumphing 11-5, 11-8, 11-9 in just 34 minutes to claim her fourth Qatar Classic crown since 2006. "It's great to win again in Qatar," David said later. "I didn't like losing here last year. "Rachael and I know each other's games so well, you're always going to get close matches and long rallies," explained the new champion after extending her head-to-head record to 26-6. "You try not to think about past matches, head to head records - but the one you lost always comes to your mind and you know it's not going to be easy. "It was great that the crowd got involved, I get so much support here it really helps, so thanks to the supporters, the organisers and the sponsors for another great tournament, it's so good to keep coming back here year after year. "It's good to finish the WISPA season on a winning note. Now it's back to Malaysia for a few days and then join up with the rest of the team for the Asian Games." Grinham rued missed opportunities in the third game: "I maybe wasn't as patient as I needed to be today, especially when I was up in the third, I tried to finish it too quickly I think. "I wasn't as accurate as I'd like either, I sprayed a few balls around and missed a few basic straight shots, it could be about a bit of stiffness and not being as properly stable on the shot, but that's something everyone has to deal with," added the 33-year-old Queenslander. "Not too bad overall, but I could have done with snatching that third." Avenging her straight games defeat in last year's final, Australia's Rachael Grinham upset England's second seed Jenny Duncalf in four games to reach the final of the 2010 Women's Qatar Classic, the $74,000 WISPA World Tour squash event at the Khalifa International Tennis & Squash Complex in Doha. Duncalf, the world No2 from Harrogate, took the opening game - but fourth seed Grinham regrouped and reclaimed the advantage before going onto win 9-11, 11-5, 12-10, 11-5 in 41 minutes. "Last year was a shocker really, one of those days, I just couldn't hit anything," the Queenslander said later. "Not to mention that Jenny was chopping everything. "Today, I felt good, and I'm rather happily surprised with the way I pulled up today," added Grinham, now in her 58th WISPA final. "I'm going to try and loosen myself up, to try and get prepared to play Queen Nicol! I used to beat her, I haven't for a while though, and it's a nice challenge to look forward to." After sensational upsets over the event's third, thirteenth and sixteenth seeds, 17-year-old El Tayeb finally met her match in Nicol David, the 27-year-old world number one from Penang who is unbeaten so far this year. The Cairo teenager, ranked 35 in the world, made her mark by taking a game off the dominant David - but the favourite went on to win 11-7, 11-2, 5-11, 11-6 in 47 minutes to reach the 65th Tour title of her career. "I tried to keep the ball tight, and the rallies long, and to play all the shots I could possibly play, run and make her run," explained El Tayeb afterwards. "To be honest, I'd never run as much for a single game than I did in that first one! So after that, I was a bit tired. "This tournament has been so great, I think I am on the right track. I was in the semi final - but more importantly, I put Nicol David, world number one, under pressure!" David admitted that she was fully aware of El Tayeb's potential: "I've been watching her for a long time now, and she has come up so strong! "Today, I was so expecting her to play like that, I was prepared to run for all the nicks, for the four corners, and did she bring her game up. And like all the Egyptian players, when she gets on a roll, she is not going to stop!" David is now one win away from her ninth Tour title this year - but the 50th of her career! Nour El Tayeb produced her third successive giant-killing conquest in the Women's Qatar Classic when she beat 13th seed Joelle King to reach the semi-finals of the $74,000 WISPA World Tour squash event at the Khalifa International Tennis & Squash Complex in Doha. The 17-year-old from Egypt - who recorded career-first wins over compatriots Omneya Abdel Kawy, the No3 seed, and Nour El Sherbini, the 16th seed, to make the quarter-finals of a WISPA Gold event for the first time - defeated New Zealander King 11-8, 7-11, 11-9, 11-6 in 49 minutes. "I haven't played on this court before, but I coped well with it - it suits my game as shots to the front stay in, it's a bit dead in the corners," the world No35 from Cairo said after her shock win over the Kiwi ranked 15 places higher. 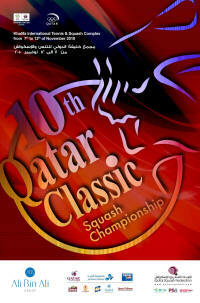 "I can't believe I won - quarter-finals of the Qatar Classic is huge for me. I'd only looked at the points and prize money for the first round!" Next in line for the exuberant teenager is Nicol David, the world number one from Malaysia who is seeded to win her 50th Tour title in Doha. "Tomorrow I play Nicol David - the pressure is off, I'll just try to enjoy myself and see how good the world number one is," added El Tayeb. David defeated Australian Kasey Brown 11-6, 12-10, 11-7 in 39 minutes. Defending champion Jenny Duncalf celebrated her 28th birthday with an 11-7, 11-4, 11-8 victory over England team-mate sixth seed Laura Massaro. "I feel pretty good at the moment," said the second seed from Harrogate. "I've been playing bunches of tournaments. I've been away from home for a couple of months. I guess I'm in a 'playing matches mode' at the moment, but at the moment, I keep on winning. "It's nice to be out on this court. My victory last year here was a great platform for me - it got me to world number two. "And it would be a great birthday gift if I could go back home with a trophy!" Duncalf will meet Tour rival Rachael Grinham in a repeat of last year's final. The 33-year-old fourth seed from Australia was fully stretched by Raneem El Weleily before prevailing 12-10, 9-11, 14-16, 11-7, 11-5 in 49 minutes over the 21-year-old eighth seed. Egypt's 17-year-old Nour El Tayeb (left) extended her sensational run in the Women's Qatar Classic to reach the quarter-finals of the $74,000 WISPA World Tour squash event at the Khalifa International Tennis & Squash Complex in Doha. El Tayeb faced 16th seed Nour El Sherbini, the 15-year-old former world junior champion who had previously always held the upper hand over her older national rival. But, boosted by her maiden win against the Egyptian number one Omneya Abdel Kawy 24 hours earlier, El Tayeb clinched her first victory over El Sherbini in an impressive 11-7, 4-11, 11-2, 11-4 win in 34 minutes. "Same as yesterday, except for the second when I thought 'I'm one up against Nour - that never happens', and I decided to go short too early and she just killed me," explained the jubilant winner said later. "In the third, I remembered yesterday's match and started to pin her to the back, and then I could win the points. "I'm happy to be in the quarters, and I'm not done yet," added El Tayeb. "To be in the Qatar quarter-finals, that's something!" The youngster will now face Joelle King, the 13th seed from New Zealand who upset France's fifth seed Camille Serme 11-7, 11-8, 11-13, 10-12, 11-8 in 70 minutes in their first meeting on the WISPA Tour. "I've lost so many close matches, and so many from two-nil up - I did that in Hong Kong last week - that I told myself in the fifth I couldn't let it happen again," said King. "I wasn't going to get a chance to play the match again in ten minutes." The 22-year-old Kiwi was one of the stars of last month's Commonwealth Games after winning a gold and silver medal against expectations to become New Zealand's most successful athlete in Delhi. "Winning the medals at the Commonwealths has given me a confidence boost I think. The Games are a big thing in New Zealand, so when I get home there's usually just my Gran and boyfriend waiting for me - but this time, coming back as the most successful New Zealand athlete, it was just huge! "It's funny, Nour and I played each other in qualifying here last year - and now we'll be playing the quarter-finals!" 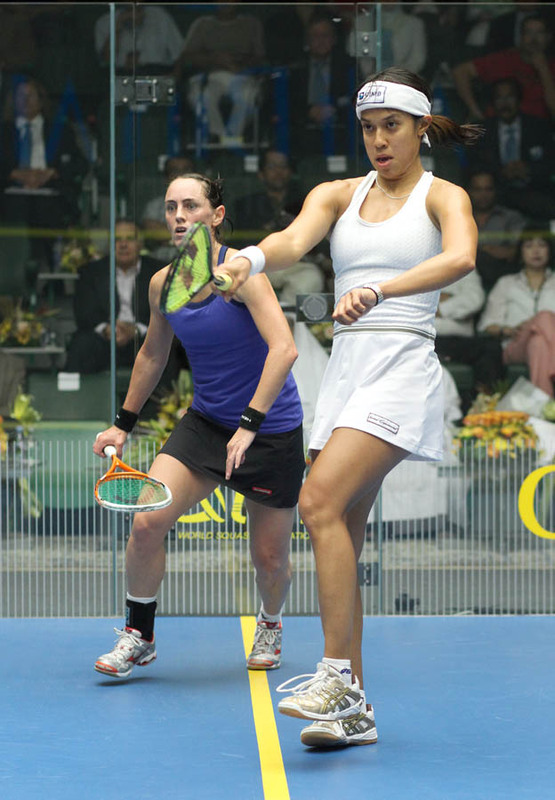 Top seeds Nicol David and Jenny Duncalf are on course to meet in the final. David, the Malaysian world number one, despatched Australia's 11th seed Donna Urquhart 11-5, 11-4, 11-4, while - on the eve of her 28th birthday - England's second seed Jenny Duncalf needed four games to see off New Zealander Jaclyn Hawkes 11-8, 12-10, 4-11, 11-4. Teenagers Nour El Tayeb and Dipika Pallikal produced notable upsets on the opening day of main draw action in the Women's Qatar Classic, the $74,000 WISPA World Tour squash event at the Khalifa International Tennis & Squash Complex in Doha. Rapidly-rising 17-year-old Nour El Tayeb struck the mightiest blow, beating fellow Egyptian Omneya Abdel Kawy, the third seed, 11-7, 11-5, 11-6 in just 27 minutes. The first ever victory over world No4 Abdel Kawy, her country's highest-ranked player, comes only a week after El Tayeb defeated the Egyptian No3 Engy Kheirallah. "I played well," conceded the youngster said later. "But I had to beat Omneya in three - and that doesn't happen every day! "I beat Engy two weeks ago in New York and I've been playing well, so I knew I had a chance, no more than that. I certainly didn't expect to win, I'd never even taken a game off Omneya before," added the world No35. India's Dipika Pallikal made up for the disappointment of having to miss last month's Commonwealth Games in her home county when she recorded a stunning 13-11, 3-11, 4-11, 11-4, 12-10 victory over Ireland's 15th seed Aisling Blake in 64 minutes. "The last month was just awful for me, having to withdraw from the Commonwealth Games with illness," admitted the 19-year-old from Chennai. "It took me three weeks before I could come out of my room and talk to someone. "But I'm pleased to be back playing, and looking hopefully I can play well tomorrow." Top seed Nicol David, the world number one looking for her 50th title on the WISPA Tour, eased into the second round after beating England's Emma Beddoes 11-6, 11-4, 12-10.